Example of a past CGM screen. Before I begin let me Thank TotalDiabetesSupply.com (TDS). Did you know I’ve worn a Continuous Glucose Monitor (CGM) before? Except for very INTENSE exercise my blood sugars stay sub 100 mg/dl all day… pretty much a flat line with small increases associated with meal times. A CGM is typically used by insulin dependent diabetics to help them monitor and treat their diabetes, often in conjunction with an insulin pump. Here are a few previous posts from the past using screen shots of the CGM. ADA Can’t Touch This, Exercise and CGM, and this is the post I tracked my OGTT with a CGM. My point? I miss not being able to show people the usual flat line, of maintaining steady, truly normal blood sugars. Displaying a 12 or 24 hour flat line creates a stark contrast to the typical diabetes roller coaster; the soaring highs and crashing lows that most diabetics experience. On the 15th, I tested my blood sugars numerous times in an attempt to give you a sense for my ‘steady’ blood sugars. 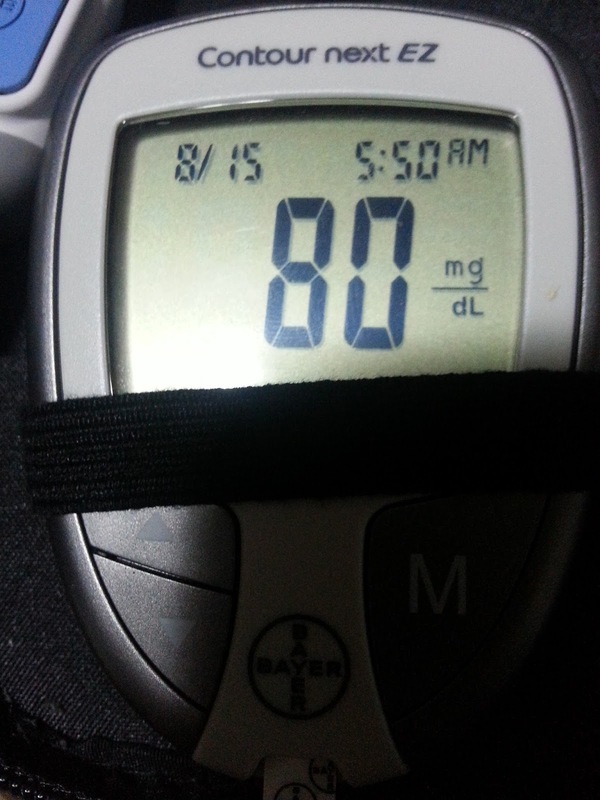 Below is my overnight Fasting Blood Sugar (FBS). This was taken within minutes of waking. Note: Add an hour to the times, I never reset. For example, this test below was done at 6:50 AM. About two hours later, after drinking coffee and moving around a little, a 74 mg/dl. I only drank water and coffee prior to a 2 mile bike ride to the local park. It’s not a VERY intense ride but I always push myself. I usually have a 10 -15 point increase in blood sugar. The result was expected, a 16 point bump from my last reading five hours earlier. After taking this blood sugar reading I ate a handful of WILD crabapples and two handfuls of ripe and unripened WILD grapes. :) 90 mg/dl. I guesstimate I consumed @ 12 grams of carbs from the crab apples and about 12 grams of carbs from the grapes. Some of the grapes were ‘green’ and I did account for their reduced sugar totals, but this is a ROUGH estimate. After eating the foraged fruit, I discovered a flat tire on my bike. Instead of calling and getting a ride I decided to push my bike home. To Complete the 24 hour ‘day’, below is my overnight fasting blood sugars the next morning. 75 mg/dl. When testing blood sugar levels with a meter, one never really knows the highs and lows of the day. You only see a ‘snapshot’ at that moment in time. In all likelihood, the actual lows and highs exceed your readings. The odds are slim that you would test at the exact highs and lows. Still, I had a 16 point difference in blood sugars readings from highs to lows… I’ll take it. From my past experiences of wearing a CGM (for more than a month) and from the numerous tests… my blood sugars stay sub-100 mg/dl the vast majority of the time. My only usual trips above 100 are due to very intense exercise, the rare high-er carb meals and even more rare cases of illness, injury or excessive stress. Below is an approximation of how my blood sugars might look on a CGM, the chart does show the actual data points from my testing. I love seeing a relatively flat line. Go “Very Low Carb Paleo“. Want to learn how to reduce blood sugars … naturally? Start today! Click Here for Kindle!